Spa-Francorchamps is considered by many to be the finest racing circuit in the world and is a favourite of many of the F1 drivers. The kind of atmosphere you get at Spa for the Belgium Grand Prix is something akin to the old Nurburgring. It is fast and modern and possesses a huge number of really excellent viewing areas. 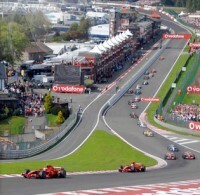 It is one of the favourite F1 venues for drivers and fans - Eau Rouge is really one of the great corners in F1. Spa-Francorchamps made a welcome return to the calendar in 2007 with a revised start / finish line and a wider track at the La Source hairpin. After the dramatic start, the circuit rises and falls in spectacular fashion through the wonderful forests of the Ardennes - which are also responsible for the ever changing weather. The Belgium Grand Prix consistently provides races of constant changes and drama; the recently upgraded Spa Francorchamps invariably offers a brilliant motor-racing experience. We have been looking after corporate clients, VIP guests and small groups for many years and our attention to detail is second to none. We know the Ardennes region superbly well and are therefore able to advise on a seemingly bewildering array of possibilities to provide you with a memorable weekend. Please call us for a bespoke quote. Our bespoke packages offer a choice of destinations and hotels with the choice of a self drive tour using Eurotunnel or P&O Ferries or travelling by rail on the Eurostar or travel by Air. The 4 star Novotel Aachen is centrally located in the heart of the imperial city, just a few minutes' walk from the Old Town and Cathedral. The hotel houses 154 rooms; each guest room is air-conditioned, sound-proofed and spacious, with WIFI, a desk, sofa and tea/coffee-making facilities in an innovative design. The restaurant offers regional and international dishes, along with the bar and large sun terrace. Relax in the steam bath housed within the fitness area, which looks out across the city. It is also very well placed for the Spa-Francorchamps circuit being only 45 minutes away by car. The Novotel Aachen is voted #2 off 44 Aachen hotels by Trip Advisor. Public car parking can be found underneath the hotel. 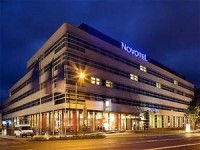 Novotel Aachen guests receive a discounted rate of 14 euros per day. To receive the discount, please contact the hotel reception. The entry to the parking (Q-Park) is in Schumacherstrasse 12. A reservation for a parking place is not possible as it is a public parking area. Aachen train station is 1.2 miles from the Novotel. Prices based on 4 in a car - occupancy supplements apply as below. Packages by rail depart from London St Pancras to Aachen with a journey time of approximately 3 hours with a change in Brussels. We can offer circuit camping in both the Green or Yellow Zones. Each pitch is 40m2 and includes parking for 1 vehicle. There can be a maximum of 5 guests on each pitch. The campsite has temporary toilets and showers. There are snack bars selling breakfast, lunch and drinks. The pitches have no dedicated connections to water or electricity. Guests with a weekend camping pass can arrive on Thursday from 08:00 and leave on Monday by 11:00 without any extra charge. Fire, firecrackers and fireworks are strictly forbidden. Barbecues are authorized. The permanent Eau Rouge campsite is privately owned and run and offers a peaceful and green environment for camping and caravans. The well regarded campsite includes recently refurbished shower and toilet blocks, optional water and electric supply as well as a bar / restaurant. There is also a supermarket within walking distance of the campsite. To the Stavelot corner, it is approximately 1.5 km. To La Source, it is approximately another 2.5 km. Alternatively one could drive or cycle. The campsite has a good F1 atmosphere. 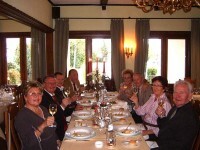 This prestigious gastronomic Restaurant is the choice of many of the F1 teams including Ferrari. Close to the La Source hairpin in the village of Francorchamps, it is approximately a 20 minute walk from the principal Gold Grandstands. We offer this facility post Grand Prix as the traffic can be heavy after the end of the Grand Prix. The restaurant is also offers privileged parking to allow the easiest of exits from the circuit. Our helicopter option offers a direct and effortless way to arrive into the centre of the circuit from the Liege area. No individual seats available, only group charter of 6-8 seater Dauphin N3 helicopters. We can offer an array of grandstand places - due to fluctuating costs and exchange rates, we will confirm upon booking. We are also aware of the high prices of grandstand seating; Spa is one of the finer circuits to enjoy a general entrance ticket - Bronze. If you are prepared to walk, you can be rewarded with some excellent viewing as right. A Weekend Bronze ticket is £155 per person.